The recently enacted law banning the sale, trade, and possession of shark fin in the Northern Mariana Islands will be highlighted at this month’s meeting of the Association of Pacific Island Legislatures. Representative Diego T. Benavente has been invited to speak on the subject and will premiere Rob Stewart’s new short video, Sharkwater Saipan. Rep. Benavente introduced the shark fin bill, which was signed into law on January 27, 2011 by Governor Benigno R. Fitial. Sharkwater Saipan tells the story of Kathy Pagapular’s sixth grade class at San Vicente Elementary School and how a class project led to the world’s second shark fin ban. The video features interviews with Kathy and the students, as well as Rep. Benavente and Beautify CNMI’s Cinta Kaipat. 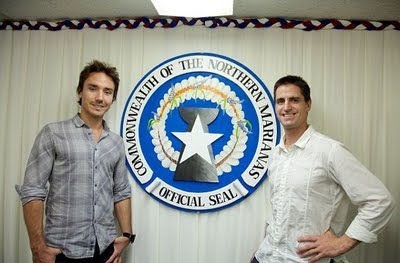 A preview of Sharkwater Saipan will play on KSPN 2 on World Ocean’s Day on June 8 during the 6 O’Clock News. People around the world are overjoyed (and rightly so!) that after the bill was introduced by a Rep. Diego Benavente- both an avid recreational fisherman and island leader- the island's children led by teacher Kathy P. supported the bill in it's path to become a law. It was a combined effort started by a fisherman with many, many on and off island figures that pulled together to insure the bill's success. The class played a key role and it is very important for the world to see that anyone and everyone can make a world of difference when you put your mind to it.